The whole point of physical rehab, mental rehab, alcohol rehab, or drug rehab, is to return people to wellness. To do that, the person treated needs to be challenged. Yet, thousands of addiction treatment centers and therapists pamper their clients instead of challenging them. That’s because the field of alcohol treatment, drug addiction treatment, and mental health treatment, have been taken over by a “marketing” and “customer service” mentality. The approach of giving the client what they wish is effective in every service industry, except therapy. Giving clients what they wish instead of what they need helps clients stay sick. Because in the process of therapy, clients often crave the things that cause their problems and kill them. Of course, clients receiving therapy would prefer that a physical therapist would not make them do things that cause pain. A person trying to get fit would love for their personal trainer to show them a way to get muscle mass without putting them through painful exercise routines. And, it’s very understandable that clients in psychotherapy want their therapist to offer some magical cure, program, or advice, that will help them grow out of their suffering; without having to face the pain of changing. Selling the promise of a quick and painless fix has always been good business. I understand how the promise of easy therapy is appealing. And, I also understand how it’s very profitable. Selling the promise of a quick and painless fix has always been good business. Selling easy cures, magical potions, and easy enlightenment has always been big business. But we know that all quick fixes end in failure. The number of failures in the addiction treatment and psychotherapy fields proves the inefficiency of magical-solutions-therapy. Yet, in my experience, it’s the most frequent form of therapy being offered today. I find it increasingly hard to find fellow therapists that want to practice psychotherapy in its true form. An ever-growing number of them want to be gurus, preachers of old and new faiths, purveyors of magical cures, or expert advisors on how to live. I often ask myself “why?” Why would they go through the long process of a college education, professional training, and state licensing, in order to become psychotherapists, and then not practice psychotherapy? Not practice the very thing that they studied, and trained for? The only straightforward answer that I have come to is that true psychotherapy is very hard to practice. It’s easy, pleasant, and profitable, to give people what they wish. To agree with people, to accept flattery, to flatter them back, and give them advice. On the other hand, it is hard to reflect a painful reality to a person that’s suffering. And, in the majority of cases, the reality that brings a person to treatment is painful. It’s hard to show a person how they hurt themselves and others. It’s hard to find a way to help them accept pain in order to get better. It’s hard to keep them motivated to keep coming back for more discomfort to get better. And, it’s hard to reject being put on a pedestal. It’s hard to risk their withdrawal of admiration, and willingly reject the self-gratification that comes with that admiration. It’s difficult to put your livelihood in jeopardy by risking that clients will leave because you don’t indulge in their delusions. It’s difficult to reject the shared fantasy that you have the power to give them the answers and solutions to their problems. It’s business suicide to anger clients by refusing to give them what they wish, for the sake of giving them what they need. To be asked to jeopardize the success of your business for the sake of your clients is an inhuman demand. And yet, it’s precisely what is demanded from a true therapist very often. And then, there is the rigor of the therapy process itself. To engage in real depth psychotherapy is not pleasant. It doesn’t feel good to face the things that harm us. The parts of ourselves that need healing usually are the ones that we avoid. This is true for both clients and therapists. Doing deep therapy demands hard work and emotional fortitude from both. It takes education, experience, training, and hard personal work to become a true psychotherapist. Doing deep therapy involves accepting being disliked, judged, and disapproved of sometimes. Things that a human being naturally avoids. Being an effective therapist also demands the unnatural capacity to reject being turned into an object of adoration, desire, and authority. A therapist has to reject the status of expert, priest or guru, has to train to let go of things that a human being naturally seeks, all for the sake of the client. If they don’t have the maturity and fortitude to reject the status that others naturally seek, they won’t be effective therapists. A therapist is someone that shows up to work and goes through little crucifixions for their clients. To reach the depths of a person’s problems and suffering, the therapist necessarily becomes the recipient of that person’s unconscious content. The therapist receives the anger, disgust, hatred, love, or adoration that the client holds in their unconscious. The therapist becomes the screen onto which the client projects the parts of themselves that they don’t want to face. The therapist becomes the father or mother that they long for, or hate. The idealized guru that will save them. The rejecting lover that humiliated them. The client projects the unwanted parts of themselves onto the therapist so they can get rid of them. And, what does the therapist do? The therapist holds these projections for them, and reflects them back to them, like a mirror. Without owning them. Without returning anger with anger, or disgust with disgust, or rejection with rejection. The therapist feels the natural desire to react. To scold. To protest. To also get rid of the unpleasant, hurtful, and threatening thing that they get from the client. But instead, the therapist holds them. These are the “crucifixions” that my mentor John Heider talked about. The therapist helps the clients to be liberated from their dysfunctional beliefs and emotions by keeping them and reflecting them back, from a safe distance. Clients will then be able to see their conflicts, safely, outside of themselves. Being shown to them by a benevolent person that wants the best for them. A person that does not judge them. A person that feels ” unconditional positive regard” for them. And, at some point, they will be emotionally strong enough to own that those dysfunctions belong to them. They will be able to accept them as their own. They will recognize the ways in which these dysfunctions manifested themselves in their lives. And then, the client and the therapist find a way to manage the client’s dysfunctions and conflicts successfully. This is a hard process. This is hard work. If a therapist is immature, fearful, or eager to please, they will fail to hold the client’s worst projected conflicts. They will respond to being seen as stupid, incompetent, or disgusting, by making the client feel stupid, incompetent, or disgusting. Or try to pacify them by pandering to them. The process of painfully owning the parts of us that we run from will never happen. Nothing will change. As true psychotherapists, we can’t accept and own the client’s projections. They don’t belong to us. We can’t indulge in their projections. We can’t indulge in feeling like gurus, and we can’t adopt into ourselves the belief that we have the ultimate truth, or are flawless, and that we are masters of knowledge that we are trying to obtain ourselves. The clients think we are, but that doesn’t make it so. And, if we accept the projections, and join the clients in indulging in them, then we are all delusional. We are all lost. Therapists who are dependent on approval and self-gratification, who lack emotional fortitude to withstand negative emotions, or who are primarily motivated by profit, will fall into accepting and joining in the client’s projections of them. In doing so, they validate the client’s dysfunctional views of self, others, and the world. They reinforce the client’s maladaptive coping skills, delusions, their irrationality, and their chemical dependency. Their acceptance of the fantasy position of wise problem solver reinforces the sense that the client lacks the competency to succeed in life independently. Reinforces the belief that clients need to use others to meet their needs. This, of course, is a great business model. A dependent client is a marketing dream. If you get them to need you, they will keep coming back. Like addicts keep coming back to the source of their drugs. But that is not our profession. We are not supposed to engender dependency. We are supposed to engender freedom. Successful therapists lose their clients. Not doing so is unethical. As it’s also unethical to advertise and promise easy fixes, magical solutions, and pampering. 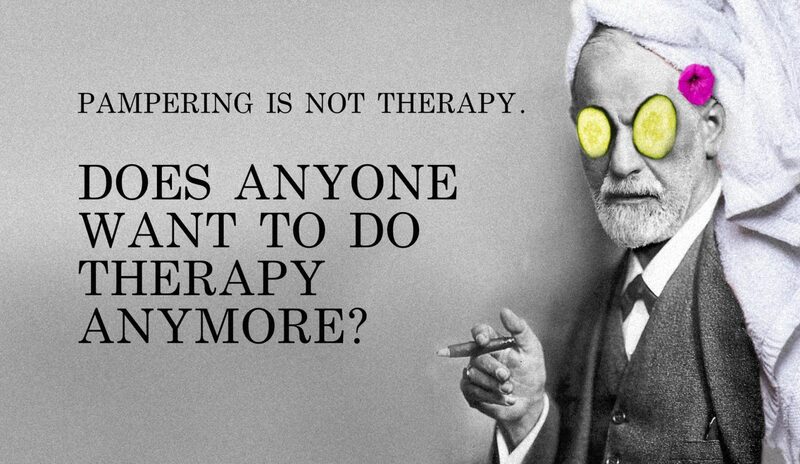 That is not therapy. And, it is shameful to call it so.